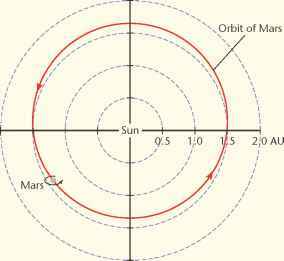 Mars orbits the Sun in an elliptical orbit that has the third highest eccentricity of all the planets' orbits. Its mean distance from the Sun is about 228 million kilometres, placing it about one and a half times further from the Sun than is Earth. At perihelion, Mars is 208 million kilometres from the Sun, while at aphelion it is 249 million kilometres. The difference between the two is about 46 million kilometres, whereas for Earth the difference between perihelion and aphelion is only 5 million kilometres. This has a major influence on Mars's climate and results in a wide range of seasonal temperatures. Mars orbits the Sun with a velocity of about 86 868 km/h and takes 687 Earth days to complete the trip. The planet takes 24.6 hours (1.029 Earth days) to rotate once on its axis, which is tilted at an angle of 25.2° to the vertical. its eccentric orbit, Mars's distance at opposition varies, so its apparent size and brightness also change. The most favourable opposition for observation is when Mars is closest to both the Earth and the Sun (this occurs about once every 17 years). Future oppositions for Mars are 29 January 2010, 3 March 2012, 8 April 2014, and 22 May 2016. 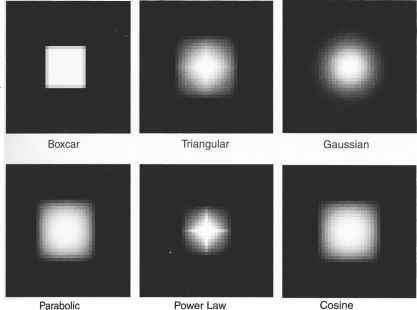 Mars can be studied easily from Earth using a telescope of moderate power. Dark markings and the white polar ice-caps may be seen on the surface, depending on the distance of Mars from Earth. Even though Mars is more than half the diameter of Earth, it has only about one-tenth of its mass. Detailed knowledge about the interior of Mars is limited because of the lack of seismic data.